Defines Requirement, Artifact, Coverage concepts. It is used in a formal sense in systems engineering, software engineering, or enterprise engineering. It identifies a necessary attribute, capability, characteristic, or quality of a system or of a process. Let "input" be a set of 4 requirements : I1 to I4. 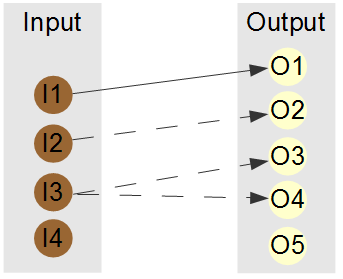 Let "output" be a set of 5 artifacts : O1 to O5. 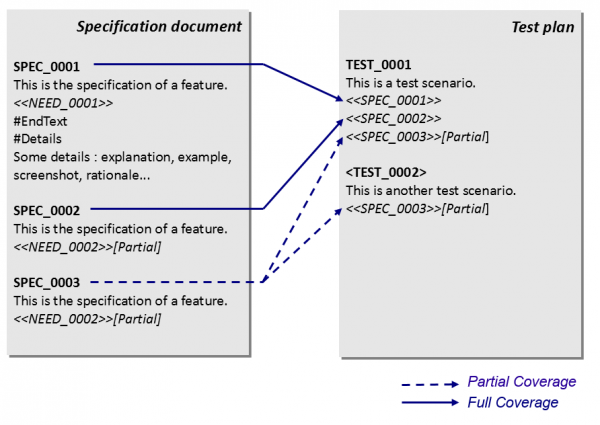 This basic example shows 3 requirements covered in 2 tests by using syntax extraction method. The coverages are drawn with an arrow. The partial coverages are drawn with a dotted arrow. Requirement I1 is covered by artifact O1. Requirement I2 is partially covered by artifact O2. Requirement I3 is covered by artifacts O3 and O4. The following text could be a WORD document that is equivalent to the example above. This is a text anywhere in your documentation. It can be in several documents. This is the description of I1. This is the description of I2. This is the description of I3. This is the description of I4. This is the description of artifact O5. The requirements and artifacts can be described in one or several documents of different type: MS WORD, MS POWERPOINT, MS EXCEL, PDF etc. Each requirement has a version attribute.